Please join me in welcoming our special guest for today, Sue Travers, who blogs at her new place, jumping aground, and at Traverselife. In her profile she describes herself as, “Playing around with words and photos has been missing from my life for too long. Here, I'm exploring what fun it can be!” She's sharing some amazing info about Australia for us today. A cloud of zebra finches rises from their improbable home, flocking to a stunted, spindly bush amongst the dusty shrubs and trickle of water that passes for an oasis in this desolate, unforgiving landscape. Crystals of salts and minerals encrust the impossibly flat land for acres around, save for the insignificant mound which I earlier referred to as a hill. When you're desperate for geographical features, the rise of a metre or so justifies the term hill, and you can certainly see for a huge distance from the easy stroll to the highest point. The crisp crunch underfoot, remarkably reminiscent to the sound of snow under snugly warm boots, is a fine layer of dry, bright white minerals, which hides the sinking softness of fine dust. Our footsteps leave clear tracks across the plane. Other tracks tell stories of rabbits scuttling quickly from bush to scraggly bush ... and well fed dingoes. This fragile landscape with natural springs, possibly millions of years old, has been securely fenced to protect the precious ecosystem from sheep and cattle which would trample the plants tenaciously clinging to life. Few others venture here. From a distance, these springs appear lifeless and boring, yet in reality they're breathtaking. There's a stark beauty, solitude, and the sense of time stood still. A piece of grass pulled from out of the mineral encrustation clearly shows the density and size of the crystal growth, it's surprisingly hard and feels a bit like a seashell. 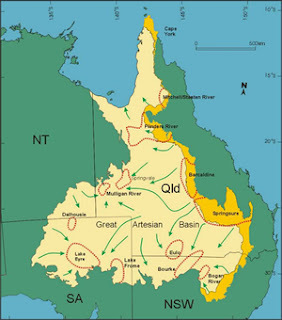 The Great Artesian Basin is the only reliable source of water throughout enormous areas of inland Australia, bores have been drilled since white settlers occupied the region. It lies under 23% of the continent, (some 1.7 million square kilometres) including large parts of Queensland, New South Wales and the Northern Territory as well as South Australia. The springs enabled Aboriginals to survive throughout the region for around 50,000 years give or take a few thousand years. The water is ancient - between a mere several thousand years up to nearly 2 million years old! Its existence now allows towns to flourish and vast cattle stations to operate. The naturally occurring mound springs provide the only permanent water source in this arid region of South Australia. They're home to a number of unusual and rare plants, fish and other creatures and provide refuge for a range of animals in times of drought. Despite their importance for biodiversity and their fragile nature, a massive uranium mine, Olympic Dam, is allowed to remove 42 million litres of water per day for free from the Great Artesian Basin which feeds the natural springs, resulting in a drop of pressure and complete drying up of the springs in some cases. This is in addition to coal mines and coal seam gas (CSG) which also use large volumes of the water. According to government estimates, the CSG industry alone could extract 300 billion litres over the next 25 years. Australia, the driest habitable continent on earth, regularly experiences extreme, devastating droughts, encourages mining operations which extract more water than can be replenished. Coal seam gas, fracking, open cut coal mines and uranium mines are dotted above the Great Artesian Basin, all using the water, and disposing of waste - not always in the most desirable ways. To read that companies "will be held accountable" and that they must specify how they'll respond to, and repair, a leak or spill doesn't inspire confidence. As Murphy's Law says "anything that can possibly go wrong, does" except perhaps in the minds of politicians or the mining industry. I took the photos above in SA near Lake Eyre. Here are some links if you'd like to explore this subject further. Thanks again Sue for being with us, and sharing something so obviously important to you. Looking forward to seeing what you'll do in the 2013 Challenge! Really great post, Sue. Thanks again for takin the time (and effort!) to guest for us. Amazing photos and I learned something - double bonus! - Trisha, I was stunned at what's happening. It doesn't make the news, and too many politicians seem prepared to ignore the issue. - JoJo, I'm glad you found the post fascinating! Water is extremely important for living isn't it. -Tina, thankyou. It's been a pleasure and I really appreciated the opportunity to fine tune my post at such late notice. - Alex. As a one-time teacher I'm pleased you not only enjoyed my photos, but learnt something as well ! - Anna, I thoroughly enjoyed taking the photos, and am pleased you enjoyed them. Hi Sue .. I can see exactly what you're saying - the enormous organisations have the most advertising power - to say we're doing great ... what they don't tell anyone is the damage they're causing today, or for that matter the damage that is being done for future generations. Great post - well written and I'm so pleased Tina encouraged you to become involved and post here .. I hope many read the post and then translate it to their own countries or areas of the world ..
Hilary, I find it hard not to get a bit political when I see what's happening with our water systems. In the cities we don't hear about the toxicity of waterways that's all too common in the country.